http://www.JewishWorldReview.com | Americans -- left, right, Democrats and Republicans -- are all sick of thankless nation-building in the Middle East. Yet democratization was not our first choice, but rather a last resort after prior failures. The United States had long ago supplied Afghan insurgents, who expelled the Soviets after a decade of fighting. Then we left. The country descended into even worse medievalism under the Taliban. So after removing the Taliban, who had hosted the perpetrators of 9/11, we promised in 2001 to stay on. We won the first Gulf War in 1991. Then most of our forces left the region. The result was the mass murder of the Iraqi Kurds and Shiites, 12 years of no-fly zones, and a failed oil-for-food embargo of Saddam's Iraq. So after removing Saddam in 2003, we tried to leave behind something better. In the last 10 years the United States has spent more than $1 trillion and has lost thousands of American lives in Iraq and Afghanistan. Both places seem far better off than when ruled by the Taliban and Saddam Hussein -- at least for a while longer. Yet the Iraqis now bear Americans little good will. They seem friendlier to Iran and Syria than to their liberators. In Afghanistan, riots continue over mistaken burning of some defaced Korans, despite serial American apologies. How about the choice of bombing the bad guys and then just staying clear? We just did that to the terrorist-friendly Gadhafi dictatorship in Libya. But now that Gadhafi is gone, there is chaos. Islamic gangs torture and execute black Africans who supported the deposed regime, according to press reports. British World War II cemeteries that were honored during 70 years of Libyan kings and dictators could not survive six months of a "free" Libya. In Benghazi, gangs just ransacked and defaced the monuments of the British war dead. Not having boots on the ground may ensure that endless chaos will consume the hope of a calm post-Gadhafi Libya. That was also true of Somalia and Lebanon after American troops were attacked and abruptly left. How about another option of aid and words of encouragement only? We have urged Egyptian reform, under both George W. Bush and now Barack Obama. When protestors forced the removal of dictator Hosni Mubarak, the United States approved. It even appears likely that we will keep sending Egypt significant annual subsidies of more than $1.5 billion -- as we have for more than 30 years. Yet anti-American Islamists are now the dominant force in Egyptian politics. American aid workers were recently arrested and threatened with trial by new Egyptian reformers. Still another American choice would be not to nation-build, bomb, or even get near a Middle Eastern country -- as is the case with Iran and Syria. The United States has not had diplomatic relations with Iran since the Shah left in 1979. Until the Obama administration desperately tried to re-establish contacts with the Bashar al-Assad regime in Syria by appointing a new ambassador, there had been nearly six years of estrangement. A final option would be to return to the old policy of re-establishing friendly relationships with Middle East dictatorships regardless of their internal politics -- and then keeping mum about their excesses. We did that with Pakistan, which has both received billions in U.S. aid and produced a nuclear bomb. Yet it is hard to imagine a more anti-American country than nuclear Pakistan, without which the Taliban could not kill Americans so easily in Afghanistan. The United States once saved the Kuwaiti regime after it was swallowed up by Saddam Hussein. We have enjoyed strong ties with the Saudi monarchy as well. Neither country seems especially friendly to the U.S. It is still a crime to publicly practice Christianity in Saudi Arabia. Fifteen of the 19 mass-murdering hijackers of 9/11 were Saudis. Oil in the Middle East costs less than $5 a barrel to produce; it now sells for over $100, largely due to the policies of our allies and OPEC members. 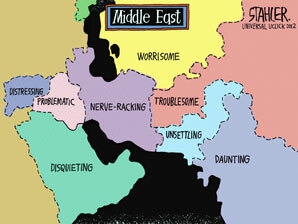 Let us review the various American policy options for the Middle East over the last few decades. Military assistance or punitive intervention without follow-up mostly failed. The verdict on far more costly nation-building is still out. Trying to help popular insurgents topple unpopular dictators does not guarantee anything better. Propping up dictators with military aid is both odious and counterproductive. Keeping clear of maniacal regimes leads to either nuclear acquisition or genocide -- or 16 acres of rubble in Manhattan. What have we learned? Tribalism, oil and Islamic fundamentalism are a bad mix that leave Americans sick and tired of the Middle East -- both when they get in it and when they try to stay out of it.